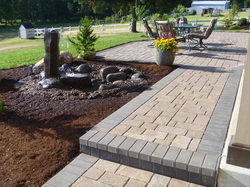 Graham Landscape and Design LLC designs, installs, and maintains residential and commercial landscapes in Dexter Oregon. 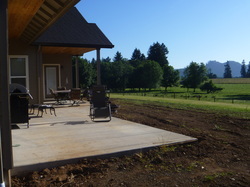 Pictured to the right is a paver patio, paver walkway, and landscape designed and installed by Graham Landscape and Design LLC in Dexter Oregon. The Problem: This homeowner in Dexter Oregon entertains family, friends, and neighbors on a regular basis. They built the home of their dreams, but were not sure where to start with landscaping plans for this new home. Design issues such as grade changes, utility locations, and wildlife in this rural area posed enough challenges, that these homeowners decided to hire Graham Landscape and Design LLC, a professional landscape design build company, to draw up plans and install a landscape to match the scale of their new home. The Solution: Graham Landscape and Design LLC created a multi-faceted landscape design to complement their beautiful new home. Part of these plans called for expanding the concrete patio that was just too small for the scale of this property. To accomplish the expansion of the patio, but to avoid the feeling of a "concrete jungle" in this rural landscape, we chose an interlocking paver in a random patter with a "soldier course" to help frame the patio. 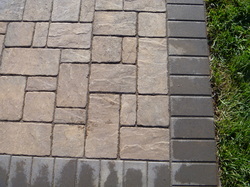 This allowed Graham Landscape and Design LLC to keep the natural feel with the random pattern pavers, but also gave definition, clean lines, and a purposeful feel with the "soldier course" to fit their home design. 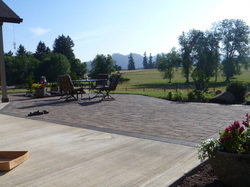 These homeowners in Dexter Oregon felt confident in Graham Landscape and Design LLC to install their paver patio and pave pathway correctly, because they were informed that our company has certified ICPI (Interlocking Concrete Paver Institute) installers on staff. There are only a limited number of ICPI certified installers in the mid-Willamette Valley. Graham Landscape and Design LLC has employed two of those ICPI certified installers for over 5 years now. Directly adjacent to the paver patio and paver pathway, Graham Landscape and Design LLC installed a simple "bubbler" waterfeature to encourage the local bird population to frequent the area. These smaller "bubbler" waterfeatures can fit into most landscape budgets and can be simpler to maintain if installed properly by a professional landscape company. Graham Landscape and Design LLC worked with the homeowner to develop a planting plan and brought in mature conifers to help the landscape not feel so "new" with smaller plants. A small seat wall and firepit were also installed a little further out into the landscape for those private intimate moments away from the main entertaining space. Graham Landscape and Design LLC suggested a decomposed granite surface for this area. Decomposed granite has a rich gold color to it and drains really well. Perfect for those more rustic parts of a landscape. The end result of the landscape design created by Graham Landscape and Design LLC is the finished product these homeowners love to come home to. The automatic sprinkler system, installed by Graham Landscape and Design LLC, makes landscape maintenance easy. Going away on vacation is a lot more peaceful when you can rest assured your landscape will receive the right amount of water and not having to rely on your neighbor to perform the daily hand watering responsibilities. Problem solved in a very aesthetic and functional way! 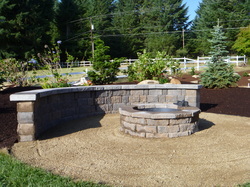 Graham Landscape and Design LLC specializes in creating and maintaining beautiful outdoor living spaces. We are well-versed in making your property more usable and valuable.